The supply and transport of sediments are important because they strongly influence channel dynamics, affect habitat quality experienced by the biota, and can be costly to manage. The dynamic equilibrium that rivers seek is between the twin supplies of sediments and water, which together determine whether erosion and deposition are in balance and thus how the channel responds. Too much sediment, or too little, can be harmful to the biota and have costly consequences for human populations and infrastructure. Many rivers have a long history of human-induced erosion and sedimentation, causing habitat degradation and altering their ecology to the point where restoration will be extremely challenging (Gore and Shields 1995). Some 13% of all rivers in the United States, and 40% of impaired rivers, were considered to be impaired by excessive sedimentation as of 1998 (USEPA 2000). Excess sediment in drinking water requires expensive filtration treatment, which is why New York City now focuses on riparian management in the watersheds that supply its reservoirs. Sediments delivered from rivers can cause serious damage to estuaries and reefs, whereas an insufficient sediment supply can cause river deltas and coastal shorelines to retreat, resulting in loss of habitat and inadequate protection from storm surges. TABLE 3.1 The Wentworth grain size scale defines size classes in intervals that increase by powers of two. and clast usually refers to larger particles. Streambeds typically include a mix of particle sizes. The composition of the bed surface determines material available for transport, which is the main focus here. It also influences bed roughness and thus the near-bed hydraulic environment, as well as bed permeability and its suitability as habitat for biota, which will be dealt with later. Because the bed surface typically is composed of a mix of particle sizes, it is useful to quantify the average particle size as well as the size range. The pebble count (Wolman 1954) is a simple and widely used method to quantify grain size of the surface layer and predict bed mobilization thresholds. The usual approach is to measure the intermediate axis of approximately 100 grains that are >4 mm diameter by randomly selecting stones from the streambed or a gravel bar of a reasonably homogeneous stream reach. However, when the streambed contains significant amounts of material smaller than 10-15 mm in diameter, samples of bed material must be passed through sieves of various sizes. A plot of the cumulative frequency distribution against a geometric progression of particle sizes (Figure 3 7) allows one to quickly estimate the median particle size, or D50. 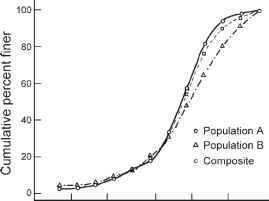 The D16 and D84 often are reported as well, as they encompass one standard deviation on either side of the mean in a normal distribution. 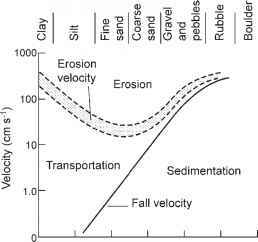 The surface layer of a gravel-bed stream usually has coarser grains than subsurface layers. 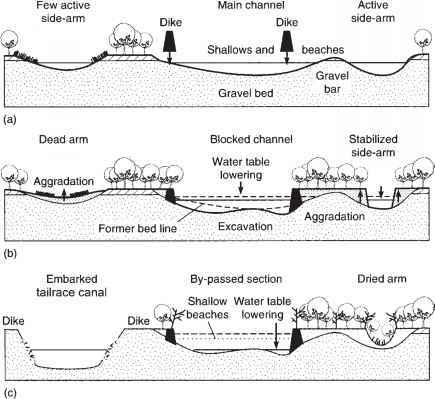 Streambed armoring refers to the vertical layering of substrate, where coarser grains overlay finer material and may prevent the latter from being entrained in the water column. This can be quantified as the ratio of surface D50: subsurface D50. Bed sediment measurement employs many methods in addition to the pebble count (Kondolf et al. 2003a). A less quantitative, but still useful, approach preferred by some biologists is to report the dominant and subdominant particle size. If the interest is in fish biology rather than in sediment transport, the fraction of gravel within a certain size range preferred by fish for spawning may be the most useful measure, and if fine sediments are limiting the intergravel flow of oxygenated water necessary for incubating fish embryos or benthic invertebrates, then their quantification is important. All sediments ultimately derive from erosion of basin slopes and water flowing across the land surface, but the immediate supply usually derives from the river bed and banks (Richards 1982). Episodes of high flow scour and transport sediments, eventually depositing them farther down the channel as flow subsides. The erosion of stream banks is an important source of sediments and of channel instability. It occurs naturally as channels meander, and can become severe when peak flows are increased. Thus, increases in impervious surface area and stormwater conveyance can enhance erosion. The process begins when streamflows cause the bank to steepen by eroding material at its base (the "toe"). As tension cracks begin to form in the upper, horizontal bank surface and water infiltration raises pore-water pressure (and increases mass), shearing begins, leading to bank failure. Soil debris is deposited at the foot of the bank, and streamflow removes the failed debris, increasing the sediment load of the stream. Bank steepening starts again, resulting in a vertical bank face and another cycle of bank erosion. Most channel banks include finer material and this provides some degree of cohesion. The root systems of plants help to hold soil in place. Grass has been found to be particularly effective at stabilizing stream banks, relative to trees, owing to a deeper and denser root system (Lyons et al. 2000). Indeed, along a stream passing between pasture and woodland, the channel has been observed to narrow and deepen in the grassy stretches, and become shallower and wider in forested stretches (Sweeney 1993). Because some land managers apparently prefer woody vegetation, the planting of trees in grassy riparian area has the potential to cause streams to become wider and shallower as their shape adjusts to the change in bank stability (Davies-Colley 1997). Bank stability can be increased in several ways. Vegetation on the bank surface both stabilizes the soil with its roots and removes soil water by uptake and evapotranspiration. Drainage tiles can be installed to remove infiltration water, which reduces the likelihood of mass wasting. Toe protection by various devices can prevent bank steepening. Bank stabilization is an important management activity, and varies from "hard" solutions such as riprap (slabs of concrete) and gabions (wire baskets of stones) to more environment-friendly approaches using vegetation. However, efforts to stabilize banks will be ineffective if incision of the streambed takes place. Urban streams present a different scenario than agricultural settings. Peak flows typically increase with urban infrastructure, and banks often are hardened because channel shifts can undermine roads and houses. Bed erosion and downcutting are the expected consequences, with considerable sediment exported to lower reaches.